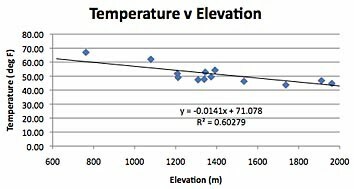 Well trying to find the temperatures for the different states and compare the USHCN data with the GISS data is proving to be more interesting than I had thought. And it is taking a fair bit more time. So when I got to Nevada, as I moved West from Missouri, I thought that today’s state would be a faster run through. Turns out that, along the way there were a couple of other issues, and so even for a smaller sized population there are some problems. (I started writing this just after inputting the USHCN initial data into the table). 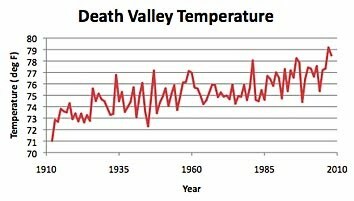 Nevada has Death Valley, which although it has some of the higher temperatures in the Union did not make either the GISS or USHNC lists, since it has only been providing data since 1910. Finding the temperature relationships started out easily. Checking with the USHCN stations first, there are only 13 stations listed, and so a quick modification to the generic file, and renaming it, made it easy to get and put up the basic temperature data. There was no data appearing until 1901 for Boulder City and there were seven years missing for Searchlight. So as I described earlier, I filled in estimates for each of these values by seeing that Boulder City (for e.g.) 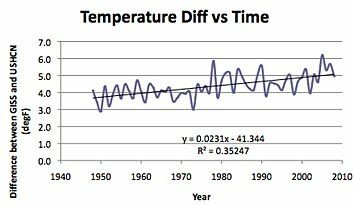 was, at 67.13 deg, 16.49 deg warmer than the state average of 50.64 deg, and that 1895 was 3.54 deg colder than that overall average. 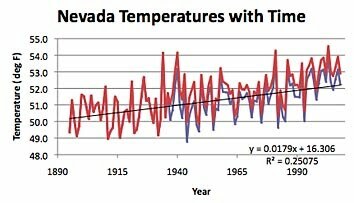 This suggests that the Boulder City temp was 63.59 deg that year. And so I filled that number in the space, and repeated the procedure to find an estimate of the rest of the missing numbers. And then, as I started to get the GISS data I started to run into trouble. I looked at the Chiefio site to find the sites that GISS uses in Nevada. Not being sure which station was in each state, I went through the list and checked (by using the co-ordinates and Google Earth) to make sure which state each station was in. And in the process discovered that there were actually four GISS stations in Kansas and not just the three that I listed. So I will have to go back and redo that state, adding in the info from the GISS station in Goodland, KS. (But I will put that off for this evening). The next problem that I ran into is that Chiefio cites two stations in Nevada as being GISS stations. These are in Las Vegas, and Ely. 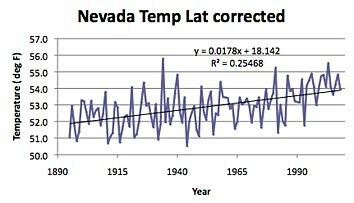 But when I open the Las Vegas data table the data only goes back to 1937. Odd, I thought that one of the criteria for selection was that there had to be a continuous record going back to 1895. So can I do the same correction to find the earlier data. Actually given that I am looking for a difference between the two sets of data, and that there are only two stations in the GISS record, I don’t think that I can do this. Wonder what the difference is? Well let me enter the data and then take a look. (Which is not the purely scientific way of doing this, but I am doing all this out of personal curiosity so press on . . . .) And it gets a bit more strange, since when I go to the Ely data there is only data since 1947. 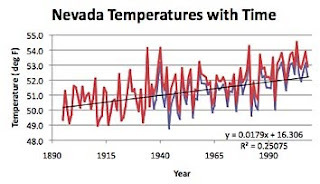 Now in Nevada there are some 35 stations listed by GISS (though I think the odd one or two are in other states), and a number of these have data going back to 1895 or earlier (see the USHCN list), so why pick two stations that only have partial data sets? Have to think a bit about that one, but in the meantime how am I to handle the lack of complete sets of data to compare? Well, in the circumstances it is a little difficult to do a significant comparison, since Las Vegas is the station with the lowest elevation in the set I am looking at, and thus has the highest temperature, so it will have a significant influence, when it is brought into the averages. In fact the difference between the GISS data and the USHCN data consistently increases over the years that there is GISS data. 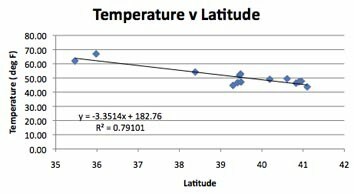 And the average difference over the time period where there are values for both GISS stations is 4.37 degrees. The impact of the added GISS stations on the overall average can be seen over the period from 1895, with the red showing the addition of the GISS data after 1945. But here in Nevada there is no significant correlation with longitude, nor is there much of a correlation with population, probably because there are not a lot of folk living near most of the stations. 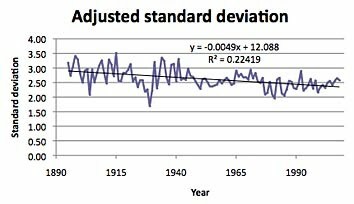 And there is not a significant trend looking at overall standard deviation of the data. 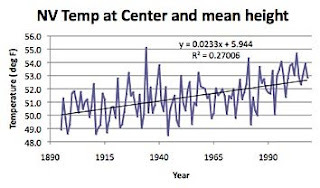 Note that I have not used the GISS data in this series, because, had I done so, since the GISS data is hotter than the average, only including it in the latter parts of the curve would give a relatively cooler initial period and hotter latter half. So I left the GISS stations out of this plot. And when we look at standard deviation, having adjusted to the center of the state and to the state mean elevation, then the plot shows a definite decrease in scatter as the years have worn on. Which is interesting, but remember that this is a relatively small sample. And so on to correcting Kansas, and then to see what California adds to the picture. This is the state that Chiefio first got my attention by writing about, and it also brings us down to the ocean, which, until now we have been far from. Today there were more questions about the data than about the hypotheses, hopefully we can get on to other things next time. Sooo many variables..... And urban sprawl contaminates so much of the data (less likely in Nv!) By the way, what exactly is the hypothesis?